From humble beginnings, London Rd. Bar & Grill encompasses over seventy years of butchery with more than thirty years of catering and hospitality experience. 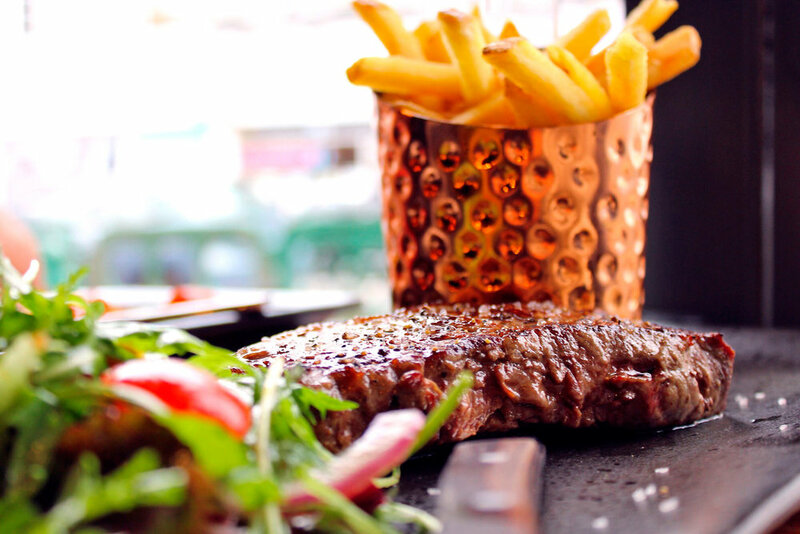 Located in the heart of East Grinstead town centre, we are open for all-day dining - whether you're in the mood for our prime, select steaks or a light snack over drinks, we've got you covered. Our premium, grass-fed British beef is sourced from the iconic Smithfields Market in London. We then age on-site for up to 45 days, depending on the cut, to provide an unprecedented taste that is truly unique to the surrounding area. Complementing the kitchen, our New York-style bar serves up an impressive array of cocktails until midnight, inspiring a lively atmosphere throughout the restaurant. We highly recommend pre-booking for dinner to avoid disappointment using our OpenTable service. Reservations are required for parties of six or more. 100% British grass-fed beef matured in-house and dry aged between 28 and 45 day. All our steaks are served with seasoned fries and salad. A stupendous American gin distilled with a fragrant blend of 13 botanicals, including; bergamot peel, coriander and orris root. Served with a rosemary sprig, juniper and Fever-Tree Mediterranean tonic. A batched American gin distilled from rye and flavoured with juniper, lavender, anise, orange and cardamom. Served with an orange peel and Fever-Tree Premium Indian tonic. Created in the heart of London, this premium English gin is a sophisticated blend of fine botanicals and exotic teas. Served with Black Pepper and Pink Pepper Schweppes premium tonic. A smooth fruity English gin created with naturally grown aromatic flavours, which are steeped in pure grain spirit for many hours to release their oils and aromas. Served with some fresh raspberries and Fever-Tree Elderflower tonic. A Scottish-made, Japanese-inspired gin, with an English woman at its heart. It is a fantastic example of East meets West with traditional gin botanicals joining cherry blossom, yuzu and sake. Served with a green apple slice and Fever-Tree Premium Indian tonic. An oriental spiced gin inspired by the exotic aromas of the ancient spice route with Indonesian cubeb berries, Indian black pepper and Moroccan coriander. Served with dry chillies, a ginger slice and Fever-Tree Premium Indian tonic. A genuine artisanal island-gin, layered with complexity. This gin has 31 botanicals and is served with lemon zest and thyme (or) mint and Fever-Tree Elderflower tonic. A Spanish gin flavoured with basil, thyme, rosemary, arbequina olive, juniper, cardamom and citrus. This combination creates a strangely arresting gin and is served with basil, cherry tomato and Pink Pepper Schweppes premium tonic. Distilled in France's Cognac region, this gin pays tribute to the grapes from which it gains it's neutral spirit. The world’s first ultra-premium batch-distilled gin, it is garnished with sliced grape and served with Ginger & Cardamom Schweppes Premium tonic. Botanically complex, this German gin combines a great story with great design. The number 47 comes from the 47 botanicals used in the distilling process and is served with lime zest and Lavender & Orange Schweppes premium tonic. AT LONDON ROAD BAR AND GRILL EAST GRINSTEAD. Are you an expert in drinking cocktails? would it be a great if you could craft some fine concoction of your own? if your after a unique event for a hen do or a team building day, a cocktail masterclass is ideal. give us a call on 01342315223 to make a booking. must be minimum of 6 people over the age of 18 and £5 deposite to make a booking. Select three from this section for your party to learn. Mix, muddle and mash three of your favourite cocktails.